While I've been here and there this month, fellow OWA correspondent Richard Valitutto has been busy celebrating the 100th anniversary year of August Strindberg's death in Orange County and filed this report. After a successful New York run in January earlier this year, Robert Cucuzza’s off-kilter adaptation of August Strindberg’s Miss Julie returned to the West Coast for a third brief appearance this past weekend as part of the South Coast Repertory’s studio series. In L.A., Cattywampus was previously presented at Son of Semele Theater in August 2011 and again at REDCAT’s NOW Festival in September 2011. I saw it this Friday, opening night at SCR. Though it would seem safe to assume that writer/director Cucuzza is laying low while his show is presented for a fourth time, this would be a mistake. Cucuzza has been fiercely involved with the continued development of the work with small rewrites and edits, not least of which being the renaming of Jean’s counterpart, the car-detailer, from Donnie to Jodie (an adjustment whose parallelism, if only for alliterative purposes, pleases me more). This in addition to the fact that the SCR Studio performances featured fresh, new actors playing both Jodie (Jacob Loeb) and Julie (Lola Kelly), though still just as well-directed and acted as their predecessors. Loeb brought to the role a fantastic kineticism, matched well by Kelly’s execution of neo-Julie’s profoundly weird sexuo-deferential entanglements. Jenny Greer once again convincingly played the true down-n-out yinzer Chrissie. Combined with the subtle and polished bluegrass lounge-rock continuous underscore – performed with joyful ease by composers Juli Crockett (guitar) and Michael Feldman (electric organ) – and the keen, economical design elements, the show’s energy was palpably crackling: pratfalls, F-bombs, Pittsburghese, and all. Cucuzza’s tragicomedy still remains true to a lot of what is already written about its previous runs. Like Strindberg’s 1888 tragedy, this version is lean, antipodal, provocative, and weird. Cleverly adapting the work to present-day Pittsburgh pauperdom, Cucuzza is a master of parallelism. Calling it an adaptation is actually slightly inaccurate, as the rewrite follows Strindberg’s plot details and dialogue so closely it feels more like a very thorough translation done by an academic Myron Cope. This “mirror effect” sometimes lends itself to hilarious conflagrations, such as when Jodie reveals his 10-year plan which will ultimately lead him to the same object of 19th-century Jean’s desire: Roumania. But it also has more abstractly poetic parallels as well: Julie’s caged finch is now a Phoenix-emblazoned kite. One element from Strindberg’s play which was curiously absent (though not conspicuously so) was the fascinating explanation of Julie’s family troubles stemming from her mother’s failed attempt to challenge gender norms, the continued repercussions of which are evident in her and her father’s behaviors. The one thing that does not readily correlate is the element of class-struggle in a naturalist’s deterministic society. It is a bit hard to accept that Julie and Jodie are as socially and morally conflicted as Julie and Jean. But as one translator of Strindberg’s play Edwin Björkman explains in his preface, the title “Miss” in “Miss Julie” really is just that (originally the Swedish fröken, like the German Fräulein), despite her being the daughter of a count. She is no royalty, just a fatefully positioned person of privilege. 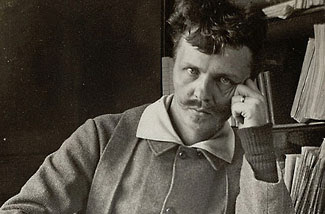 If anything, the transferral to American life may be most successful in that where Strindberg’s characters display seditious undercurrents influenced by and contributing to changing socio-economic conditions in the Swedish post-monarchy, Cucuzza’s characters are borderline sociopaths symptomatic of a failed cultural and economic system. In short, Cucuzza’s show is just that much crazier. The emotional extremes of the show were not necessarily virtuosically executed, but they communicated the spirit of passion and confusion which I’m sure Strindberg would have enjoyed. And as all good translators and interpreters know, the spirit of the word, not the word itself, is everything. Strindberg's Death in Orange County sounds like the name of a very funny play.